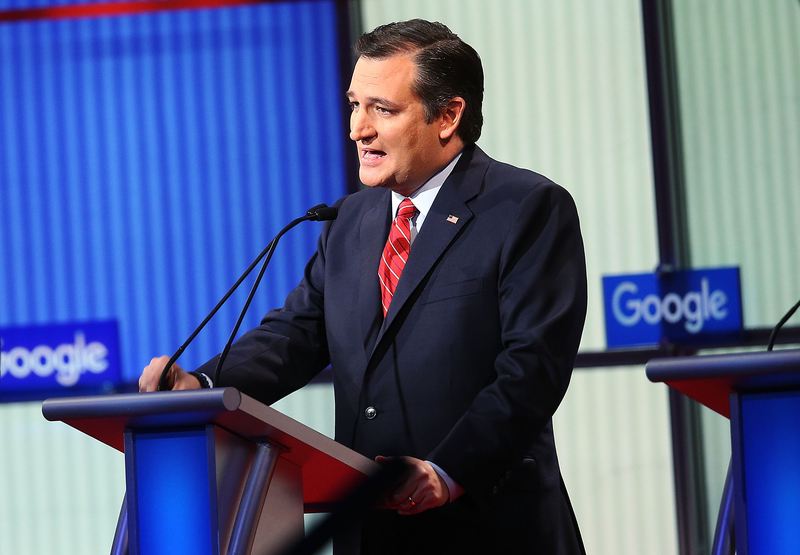 Thursday night, the remaining Republican presidential candidates (sans Donald Trump) battled in the seventh GOP debate of the 2016 primary season. Ted Cruz, Marco Rubio, Ben Carson, Jeb Bush, Chris Christie, John Kasich, and Rand Paul participated in the primetime event, arguing about everything from gun control to immigration. With Trump out of the equation, his runner-up was the main man on stage, and Cruz's closing statements focused on the Iowa caucuses. With the Iowa caucuses (the first in the country) taking place Feb. 1, the Texas senator desperately needed to woo voters in the state at the debate in Des Moines. Fox News' moderators — Megyn Kelly, Bret Baier, and Chris Wallace — asked Cruz direct and pointed questions about his stances on domestic and international issues, and the candidate took every opportunity to appeal to voters nationwide before they start casting primary votes. The upcoming Iowa caucuses will be the first real indication of Cruz's chances at the White House, and he gave the debate his all in the hope of coming out on top next week. Without Trump on stage, Cruz was the biggest target for the moderators and his opponents — something he was prepared for but nevertheless led to a few on-stage squabbles. He touted his usual pro-gun, pro-religious freedom, pro-Canadian-born U.S. citizen sentiments, while holding his ground on his economic and foreign policy plans as well. Ninety-three hours, the media noise will soon be over and it's now for the men and women of Iowa to decide. Our country's in crisis — we're worried the future of our children, and we've been burned over and over again. The central question in this race is trust. Who do you know will kill the terrorists, defend the Constitution, and repeal ObamaCare? Who do you know will stop amnesty and secure the borders? Who do you know will defend life, marriage, and religious liberty? Examine our records, pray on it, and I would be honored if you and your family would come caucus for us on Monday night. The caucuses were obviously on every candidates' mind, but Cruz talked about them more explicitly, directly asking the audience to vote for him. Without Trump standing next to him and diverting viewers' attention, Cruz took full advantage of his last opportunity to address all of Iowa and the nation.